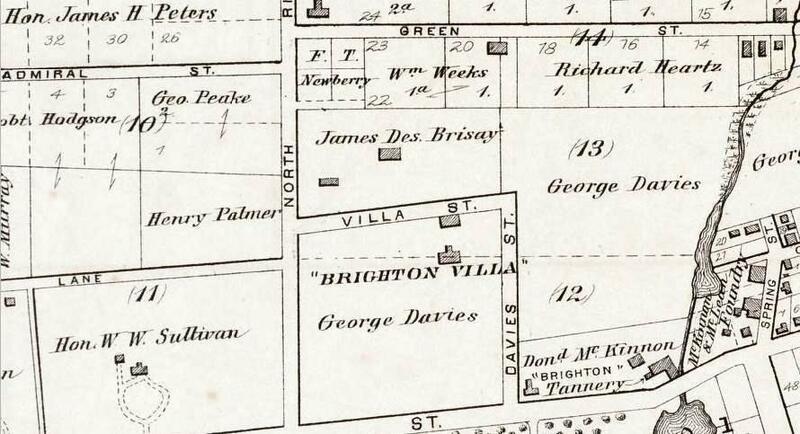 In 1860, before Ambrose Street (formerly Davies Street and later, First Street) was developed, merchant George Davies had his large house, Brighton Villa, constructed on what today would be the corner of Ambrose Street and Churchill Avenue. The 1878 Panoramic View (above) shows the beginning of Ambrose Street (above right) and North River Road (above left). Brighton Villa, the centre gabled house among the trees on the west side Ambrose, and the Brighton Tannery, the “L” shaped factory marked # 34 on the south west side of Ambrose at Brighton Road, are the only two buildings in the area. Ambrose Street, formerly Davies Street, reached up only as far as Villa Street (Villa Avenue). The Brighton Tannery, much like other tanneries in the 1900s, emitted a scent that likely influenced the lack of residential development in the area for a number of years. That was, until fire chief and tanner, Donald MacKinnon (Big Donald, of fire bell fame) built his beautiful brick house in approximately 1878. He closed the tannery shortly after building and development in the area began. We are fortunate that a number of images featuring some of the oldest houses on Ambrose Street have survived. 6 Ambrose Street (left) was constructed in approximately 1901 by Lauchlan MacDonald. It is one of the oldest houses on the street. In 1966, it was converted to apartments by then owner, Mary MacDonald. The Birches (right) was constructed in 1910 for representative of Greenshields Ltd. and amateur photographer, William Steele Louson. It was designed by famed architect, Charles Benjamin Chappell and built by Albert White. 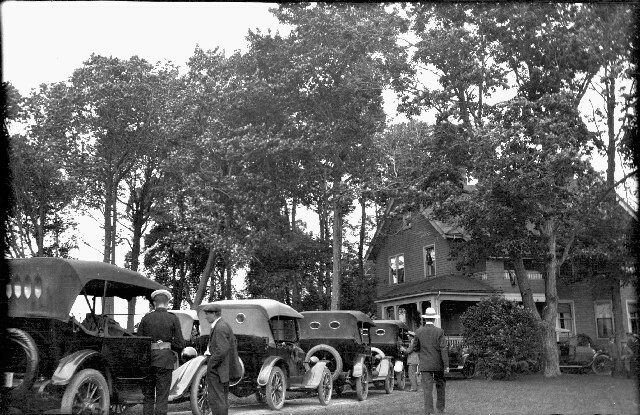 Louson was forced to sell the beautiful home and by 1918, newspapers were reporting that Mr. and Mrs. H.R. Hillson had purchased it. Mr. Hillson was employed by A. Horne & Co.; a company that sold not only carriages and automobiles, but harnesses, flour, feed and seeds. The Guardian of June 19, 1936 described a “delightful” lawn party recently hosted by Mrs. H.R. Hillson at “The Birches”. It is not clear if the image above is of the lawn party described. 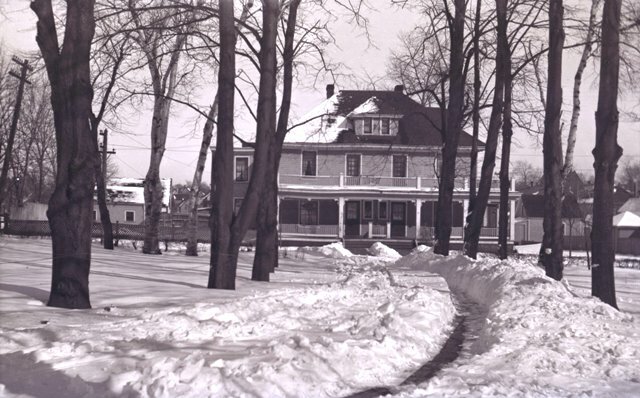 The Examiner of December 26, 1912 noted that a number of fine residences had been built in Charlottetown over the past year. One of these was Peter and Alice (Wadman) Newsom’s double tenement on the corner of Brighton Avenue (now Churchill Avenue) and Ambrose Street. 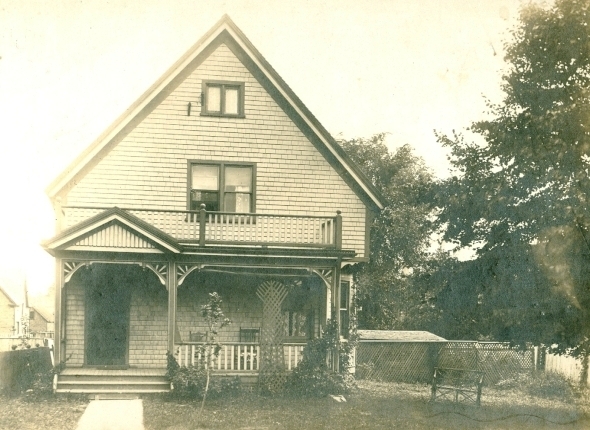 For many years, Peter and Alice Newsom lived in one half and their son, Fenton R. Newsom resided in the other.